All newborn babies cry at different periods, so how can you tell if you have a colicky baby? Because there isn't a definitive cause of colic, diagnosing the problem and understanding how to handle a baby's discomfort often feels like a hit or miss situation. According to the Mayo Clinic, colic is generally suspected if a baby cries for several hours each day and this occurs during at least three days out of the week for several weeks. Babies who appear to be colicky are seemingly quite healthy, making the occurrence of colic even more puzzling. In addition, while researchers have searched for a number of possible causes, including allergies, an immature digestive system, lactose intolerance, maternal anxiety, and even different feeding methods, the actual cause of colic is yet unidentified. How Do I Know If I Have a Colicky Baby? Some semblance of a pattern of crying is usually evident. Baby may cry every day for three or four hours at a time. Crying may begin and end suddenly. Crying is typically intense with high-pitched cries. A baby may draw his legs up to this tummy, clench his fist, and tense his stomach muscles. 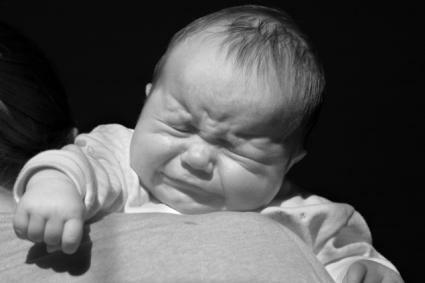 Colicky babies seem to cry more in the evenings rather than early in the day, although some babies cry off and on all day. While a diagnosis of colic isn't something to worry about, other symptoms which might occur could indicate that your child has something other than colic. While a sick baby will probably not have a good appetite and may not want to be cuddled, a colicky baby will still have a healthy appetite and may crave those extra hugs and cuddles. Colicky babies may spit up, but if your baby is vomiting or has diarrhea, she is probably sick, not colicky. A colicky baby may appear to have more gas and may have a bowel movement during or at the end of her colicky spell. If your baby has blood in her stool or experiences diarrhea, contact your pediatrician. Positions-You should try different positions with your baby to determine what is most comfortable for her. She may enjoy being placed on her tummy across your legs as you gently bounce her up and down. Warmth-You might want to lay a warm towel on your legs and then place her across it. You can also try placing her in a baby swing or putting her in the car seat and taking a drive. Vibration-Some parents have reported success by placing their babies in infant seats and putting them on top of a running dryer. Always supervise your baby if you choose this method. Burping-As you feed your baby, stop to periodically burp her throughout the feeding. Swaddling-Try swaddling your baby, and rocking him in a quiet, darkened room. How Can I Cope With My Baby's Colic? Trying to comfort a crying baby for several hours daily is frustrating, stressful, and tiring, to say the least! You will need a respite occasionally, and you shouldn't feel guilty about this. Be sure to enlist the help of your partner, along with extended family members and friends. When it gets to be too much for you, take a break! How can you help your baby if you are too stressed out yourself? Finally, keep in mind that eventually your baby will outgrow his colic. Although this will be a difficult period in both of your lives, it will pass! However, if you are concerned about your baby's extreme crying fits or you notice any changes in your child's behavior, eating or sleeping patterns, then contact your pediatrician.